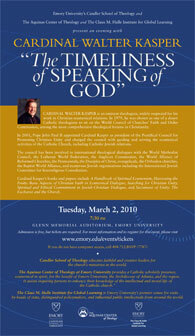 "The Timeliness of Speaking of God" (PDF) is on March 2. Video of Cardinal Walter Kasper's March 2 public address is now available on YouTube. Cardinal Walter Kasper, president of the Vatican's Pontifical Council for Promoting Christian Unity, will visit Emory University for a series of meetings and events Feb. 28-March 4. Renowned as a theologian and for his scholarship and work in Christian ecumenical and interfaith relations, Kasper will give a public address on campus Tuesday, March 2 titled "The Timeliness of Speaking of God." Tickets are sold out for the event, but the cardinal's address will be recorded and uploaded to Emory's Web site at a future date. "Cardinal Kasper's visit is an extraordinary opportunity for the Emory community to engage with a world-renowned leader on religious issues and interfaith dialogue," says Jan Love, dean of Emory's Candler School of Theology, which is sponsoring the visit along with Emory's Aquinas Center of Theology, with support from The Halle Institute. According to Love, the cardinal's presence at Candler underscores the seminary's commitment to international engagement. This year, the school has placed a priority on internationalizing its curriculum so that "students are prepared to lead in an increasingly globalized context," says Love. "The cardinal's visit is one way of addressing this priority." Phillip M. Thompson, executive director of the Aquinas Center, says the visit "is an important honor for the Catholic community, a moment when we acknowledge the work of a major theologian and figure in the Church's dialogue with other faith traditions." The Aquinas Center provides a Catholic scholarly presence, ecumenical in spirit, for the benefit of Emory, the Archdiocese and the region. It assists people in enhancing their knowledge of the Catholic tradition and engaging with the intellectual and moral life of the church. In addition to his March 2 lecture, the cardinal will meet with Candler and Emory faculty and students, including classroom visits. He will celebrate a Catholic mass on campus and preach at a service in Emory's Cannon Chapel. Emory faculty members will accompany the cardinal on a visit to the Martin Luther King Center. He also will meet with local Jewish scholars and community members, and with area ecclesial leaders. In 2001, Pope John Paul II appointed Cardinal Kasper as president of the Pontifical Council for Promoting Christian Unity and charged him with guiding and serving the ecumenical activities of the Catholic Church, including Catholic-Jewish relations. The council has been involved in international theological dialogues with the World Methodist Council, the Lutheran World Federation, the Anglican Communion, the World Alliance of Reformed Churches, the Pentecostals, the Disciples of Christ, evangelicals, the Orthodox churches, the Baptist World Alliance, and numerous Jewish organizations, including the International Jewish Committee for Interreligious Consultation. Cardinal Kasper's books and papers include "A Handbook of Spiritual Ecumenism," "Harvesting the Fruits: Basic Aspects of Christian Faith and Ecumenical Dialogue," "Searching for Christian Unity," Spiritual and Ethical Commitment in Jewish-Christian Dialogue" and "Sacrament of Unity: The Eucharist and the Church."